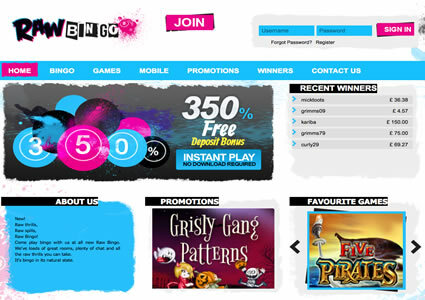 On 31st October 2014 there was a new addition to an already massive network of bingo sites but with the launch of the brand came a different take on your traditional aesthetic for a bingo homepage. Although pink can be seem on the landing page of Raw Bingo, the graphics wouldn’t look out of place on a punk rock album! 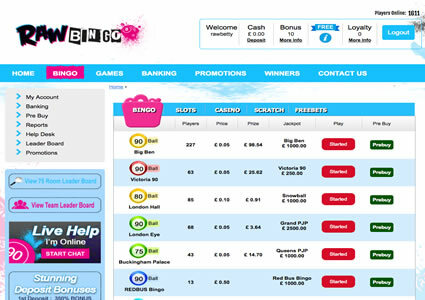 Raw Bingo have opted for the Cozy Games software and are part of the Live Bingo Network and anyone who is an avid online player will know that this means bog standard promotions, limited withdrawals, confusing wagering requirements and generally, an inferior player experience. Don’t get us wrong, playing the games that are available at Raw Bingo is good enough but you’ll be subjected to partronising chat hosts we seem to be a bit trigger happy with the preset smileys and who constantly refer to your as ‘luv’ or ‘hunni’. That said, at the time of the review, there was a no deposit required bonus on offer but once again there’s a bit of a hoop to jump through to get your cash. Unlike at other sites that just ask you to include your financial details at registration, Raw Bingo and all Cozy sites want you to validate your account through a link in your welcome email to before the cash is added to your account. Navigation around the site is pretty simple with each of the areas clearly marked from the main lobby. 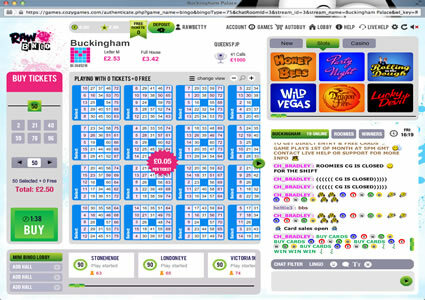 There are sections dedicated to the bingo (basically lists all the games), instant win games, promotions and winners as well as a Contact Us section. Registration to the site is a straightforward process. Choose a username, enter a few details and a password along with a credit/debit card and you are soon ready to play at the site. A plus point for Raw Bingo is the number of different bingo variants that the site has to offer. You’ll find no less than FIVE different bingo games available across multiple rooms. 75 ball pattern, 90 ball, 80 ball, 30 ball and 50 ball are all options at this site. Another good thing about these sites is that you can play the side games using bonus funds BUT if you win, winnings are added to your bonus account and are not available to withdraw. 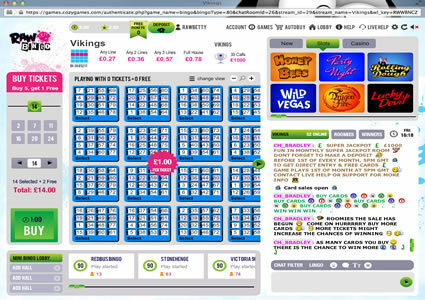 Enter any of the many bingo rooms that you have to choose from at Raw Bingo and you will find the layout is the same as all of the other sites on this network. 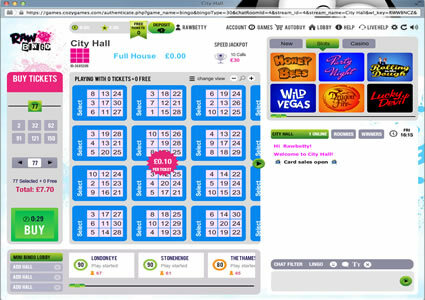 To purchase tickets you can either opt to click each individually or simply opt to use the quick buy option the shows to the left of your main bingo screen. 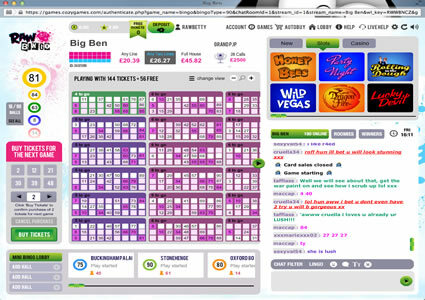 In the middle of the screen are your bingo tickets with prize money shown above the cards. To the left of the screen is the chat room which whilst busy, is quite hard to follow thanks to over zealous hosts who seem to have their mouse hovered over the smileys, they are a little ‘click’ happy with them! In summary, it’s not a bad site we’re just not big fans of the Cozy Games player experience from registration to withdrawal. The game play is ok but the chat hosts could do with some training. All of this isn’t the fault of Raw Bingo but the network/software as a whole. When it comes to customising your game play you have the choice to change your dauber colour and pattern as well as altering the volume of the caller and music at the site. This is done via the main bingo screen under ‘Options’. From the main lobby you will see that many of the rooms each have a Progressive Jackpot on offer. At least that is what the network calls them. Progressives actually increase and for the most part, they don’t on the Cozy sites with exception of a couple. Enter any room and above the bingo tickets you will see the PJP’s that are available in the room. Listed with the prize money are the number of calls that are required to win the jackpot. These seem to be quite limited at Raw Bingo. There appears to be one at Midnight every day for £250, a weekly game for £500 at 5pm on Mondays and a monthly game at 5pm on the 1st of each month for a £1,000 prize pool. There are a couple of free play rooms available at Raw Bingo which are open 24 hours a day, seven days a week. They are the 90 ball free room that is great for the new player to the site and then the Free Cash Bingo room, a must for the veteran who loves a little no cost action. To be honest, none have overly impressive jackpots on offer but are great for topping up the bonus balance when your budget is a bit low.